Fig. 2. The effect of myrigalone A (MyA) on seeds and seedlings of Lepidium sativum incubated in continuous white light. (A) Seed structure of L. sativum. RAD (lower 1/3 of the radicle/hypocotyl axis) and CAP (micropylar endosperm) tissues are indicated. (B) Typical endosperm rupture and radicle protrusion of a germinated L. sativum seed (CON, control). 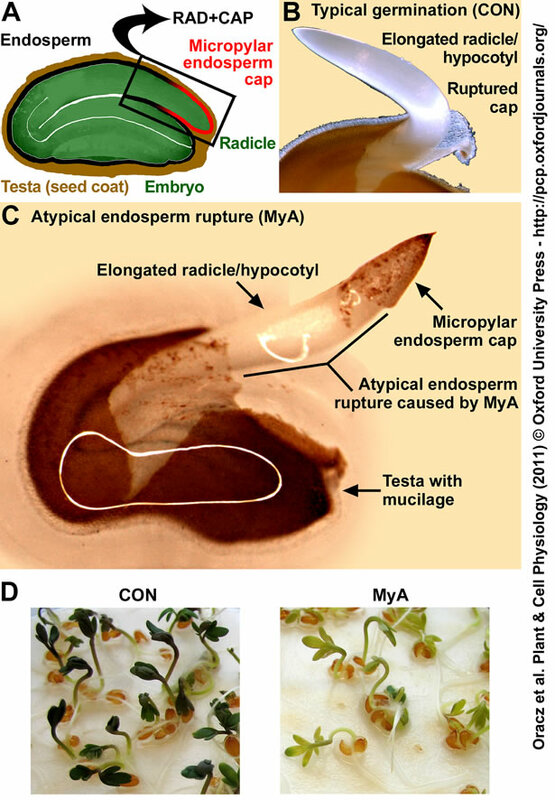 (C) Atypical endosperm rupture of a MyA-treated seed. (D) L. sativum seedlings grown from seeds without (CON) and with treatment with 5x10-4 M MyA (with bleached cotyledons).